At one end of the South Downs Way is a cathedral. At the other is the sea. Which is the start and which is the end is a question of debate. The official guidebook says the end is at the cathedral. But for me that seems wrong. Besides, it would be a rather lacklustre end – a day spent walking besides fields. Nah, the sea is a better place to end as you get a great, dramatic ending. A cliff-side walk along the best coastline in the the South East of England. Eastbourne is the eastern end of the South Downs Way, and you walk along the raised cliff edge to get there. 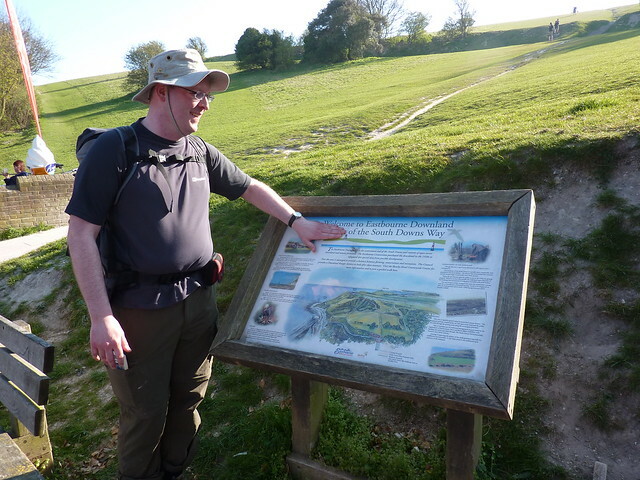 Walking up high is something of a theme of the South Downs Way. It spends most of its time on ridges, looking down at the rest of the area. 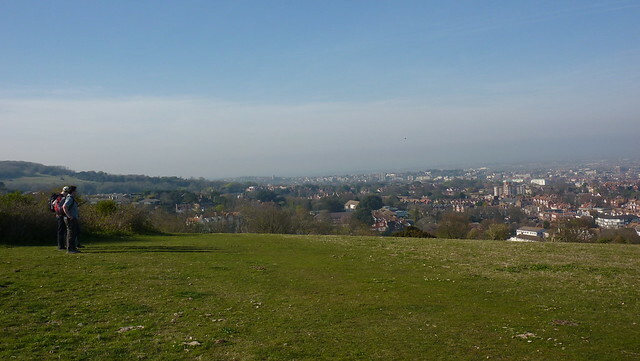 Then, as you approach Eastbourne, you look off at the town below and realise something. You realise that the hills have all disappeared. That everything looks rather flat down there. Then you start going downhill. And suddenly you’re nearly at sea level, and it feels like it’s all over. Perhaps because it is. When it comes to dramatic views at the ends of walks, the South Downs Way has it in bucketloads. Indeed it rather makes up for the fact that the actual end of the South Downs Way is slightly lacklustre. Just a fingerpost and an interpretation board mark the point, which is next to a road and a school. Oh and the board actually tells you you’re at the start of the route, not the end. A more dramatic ending can be achieved by heading down the seafront to the pier. And maybe one day they’ll make that the official end. But perhaps it would be better left where it is. With that view to admire, and enjoy. I cant wait to retire then I can get walking. I Might even start the South Downs path in he New Year. Enjoy the pint I just got you. First Published: 4 November 2012. Last Updated: 25 January 2018.